Vintaf + is very effective systemic fungicide. vegetables and pulses, tikka disease of groundnut and leaf spots of cotton. Vintaf + is work as protective and eradication. 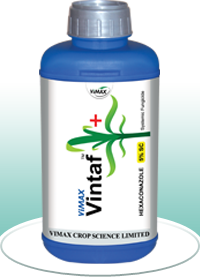 Vintaf + formulation is better than EC formulation to the crops. Zuki is different kind of contact action broad spectrum organic fungicide. Zuki has very good protective and curative action. Zuki can be use in crops like Cumin, Garlic, Onion, Potato, Tomato, Grapes, Watermelon, Cucurbits etc. 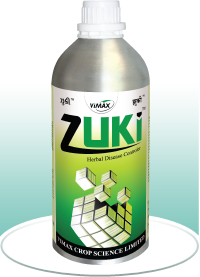 Zuki is recommended for very difficult disease like Downy mildew, Early and late blight. Zuki can be spray on any stages of crops and it is very safe to crops. Zuki is very safe for natural pollinators and environment. 250 ml, 500ml, 1 lit. Vistine is a broad spectrum and systemic fungicide. Vistine work as a protective and curative action. 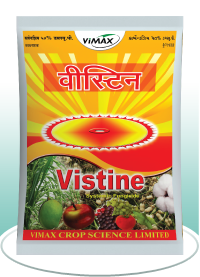 Vistine can be used for spraying, seed treatment, seedling deeping, for root disease soil drenching and post harvest application for flowers and fruits. Vistine can be recommended for plant diseases like leaf spots, wilting, stem rot, powdery mildew and anthracnose. Vistine has no resistance power even it is used for long time. 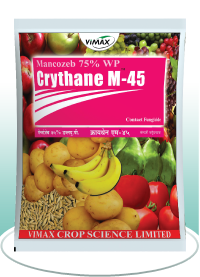 Crythane m 45 quickly control fungal diseases observed in crops like Garlic, Potato, Onion, Groundnut, Cumin, Cotton, Vegetables and Horticultural crops. Crythane m 45 is strong contact fungicide. Crythane m 45 is control Groundnut collar rot. Crythane m 45 is cost effective fungicide. Crythane m 45 usage indirectly helps to fulfill Mn and Zn deficiency of plants. Crythane m 45 is compatible with normally use insecticide. 250 gm, 500 gm, 1 kg. Maxclean is a best combination of contact and systemic fungicides. Maxclean is uniformly spread over leaf surface and persist long time. Maxclean is useful against different kind of fungus. Maxclean is used as low dose so it is safe to environment. 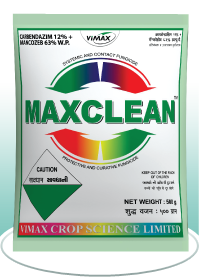 Maxclean is compatible with normally use insecticide. 100 gm, 250 gm, 500 gm, 1 kg. Cropex is very good quick action fungicide. Cropex uniform size small particles quickly absorb in to cell tube of fungus and control the fungus quickly. Cropex particles degradation is slowly so it has long duration control. Cropex spraying on cotton crop helps to improve fiber quality and length. 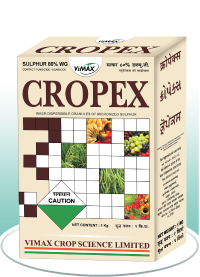 Cropex spraying on oilseed crops like Groundnut, Mustard, Soyabean etc helps to improve oil percentage and numbers of grains. Cropex has very small particle size so has very good contact acaricide action. Cropex usage on cereals crops during booting stage helps to increase yield.